I'm very late with bringing this up, but the great reclusive hip hop master producer known as Madlib (real name Otis Jackson Jr.) gave his first interview in a long time, a cover story in LA Weekly last week. It's definitely worth a read. The article describes his background and who he is, what he's about but he is in the news because of the prolific frequency of high quality material he's been putting out the last few years now, especially this year. In 2010, he's already released 10 full length albums: 6 for his current ongoing monthly Medicine Show series (original unreleased material in the odd months and themed DJ mixes of vintage records in the even months, I'll have a post up about that whole series shortly), two jazz albums under two different jazz bands that are actually consisted of Madlib himself, and full-length LPs produced for Guilty Simpson and the new group Strong Arm Steady, the latter release considered one of the best albums of the year so far. The piece is very well-written and sums up the so-called "mystique" concisely. Speculating on Madlib's whereabouts is futile. Forget Twitter — he doesn't even use e-mail. The interstellar infinity of his music indicates liberation from the limitations of gravity and time. Granted, he exists as blood and marrow: two children, lives in a real home in Eagle Rock, and the Gregorian Calendar claims that he's 36. However, he is best understood as myth. In a society with a vampiric lust for information, our primitive neuroprocessors still compute in archetypes. Madlib is the man who wears masks, the witch doctor, the star of the medicine show. While staying out of the limelight and being practically inaccessible to media outlets, he's let his music do the talking. His constant and consistent output has led to a sort of underground cult following for his work although the hip hop celebs have certainly noticed too: Erykah Badu used one of his beats for her last album and it remains its catchiest and most popular track and, as the LA Weekly article announces, Kanye West has five Madlib beats on hold for his latest album. There's no such thing as a casual Madlib fan, with a rabid cult consuming anything he releases. It's not all great, but it's always interesting. And while he may not have as many fans as Kanye West, he has Kanye West for a fan, with the Chicago rapper/producer putting five Madlib beats on hold for his new album. Of course, he won't reveal this unless you accidentally lean into his backless chair and nearly tumble to the floor. Then he will laugh, tell you that "Kanye West did the same thing," and motion to zip his lips before you can ask for elaboration. Personally, although most of my life I've been a serious fan of the type of hard-drum, dusty loop underground hip hop sound that Madlib usually employs, it wasn't until fairly recently that I was enamored enough with the sounds emanating from the huge Madlib bandwagon that I decided to really check out his music. I'd always loved his work on the classic album he produced for MF Doom, Madvillainy, but when I ventured out to hear his first couple Beat Konducta instrumental albums and some of the numerous jazz albums he's released, I wasn't impressed (and the spaced-out psychedelic jazz was too weird for my ears). 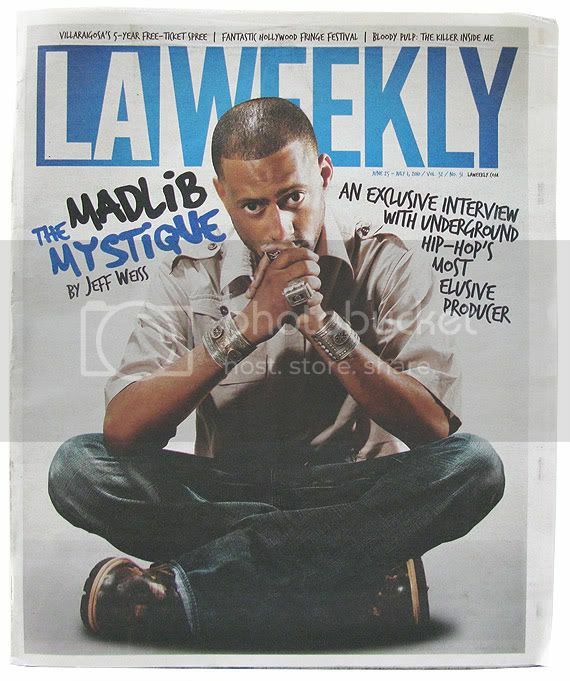 Reflecting on it now, it's interesting but perhaps not altogether strange that my true journey into the deep dimensions of Madlib's music really began when I moved to the West Coast, considering that Madlib is a West Coaster from just outside Los Angeles (Oxnard, CA to be exact). First, I liked what he did on the 2008 release of Madvillainy 2, although it was really an over-hyped remix of the first legendary album (Stones Throw records released it as a special box set) and then I was completely blown away by the music on his spring 2009 release Beat Konducta Vol. 5-6, a 42 track musical escape paying homage (often through striking, emotion-grabbing beats) to his recently deceased friend J Dilla. 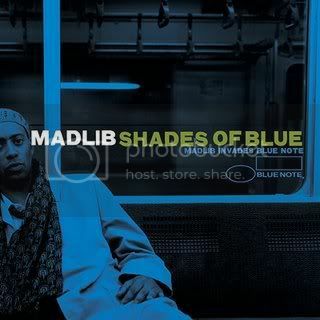 It was that album which solidified my Madlib fanhood and led me to venture deeper into his catalog, eventually discovering the phenomenal jazz/hip hop fusion album Shades of Blue which remains one of my most heavily listened-to records (I'm amazed that it came out in 2002 but didn't reach my ears until some time in 2009). So far this year, Madlib's Medicine Show series has dominated my stereo and I am putting together a little review of what we've heard from it so far. For now, I've assembled a few of my favorite Madlib beats for your listening pleasure.